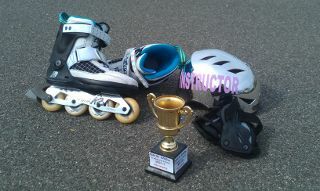 We are the most experienced and qualified instructors for miles! Group Classes run regularly, usually before the Roller Disco BUT MUST BE BOOKED as we always give priority to booked customers. £5 Child, £8 Adult, £2 Hire. When the weather is fine we hold classes outdoors on the seafront. Once you’ve booked we will contact you, so you know which site and date the next group lesson will be held. From £30 per hour (Level 1 Instructor) and £40 per hour (Level 2 Instructor). Once you book in using the pop-up form on this page, we contact you with the date, time and place of the next class that has space for you. The group classes are usually, but not always, fortnightly at the Sports Park, but in fair weather or summer months we often use outdoor seafront spaces. Don’t risk turning up without booking, or you risk finding yourself all alone at the wrong place and wrong time!